If you have ever woken up on a self inflating mat, and realised you are a lot closer to the ground than you were when you went to bed, it might mean that somewhere, somehow you have got a leak. Despite all the care that you have shown your mat, there is a hole that needs to be fixed. How to find the leak? Before you can fix it, you need to locate that puncture. You will need some soapy water (small bowl with a squirt of dishwashing liquid, or if you are really organised, a spray bottle filled with that solution). Spray the soap/water solution all over the side of the mattress where you think the puncture could be. Or if you are using the soapy water in the bowl method, lightly wet the entire side of the mattress with this water. ​Note: you don't want the water to be all bubbly and frothy before you apply to the mat because you will be looking for bubbles in Step 3. 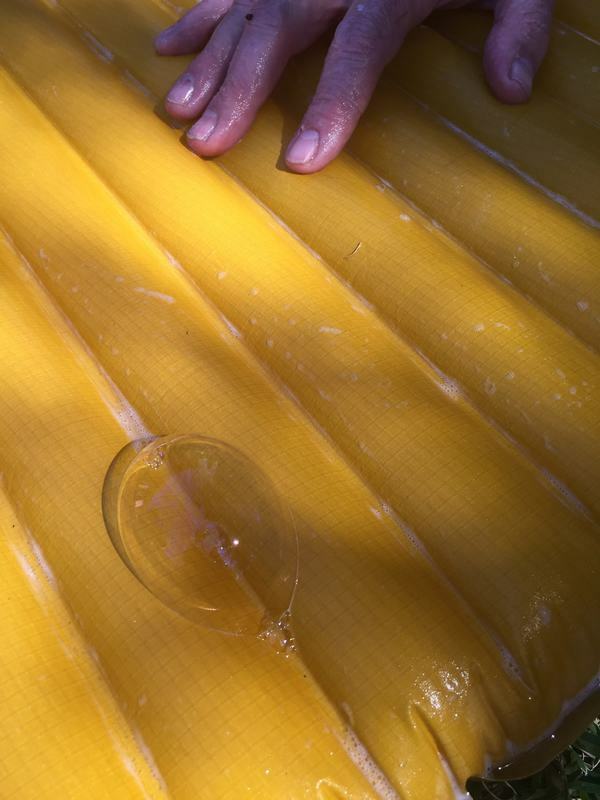 Once you have covered the mattress with the water, at one end of your mattress, start to roll it up gently. As you roll it, watch for any bubbles which are growing in size. 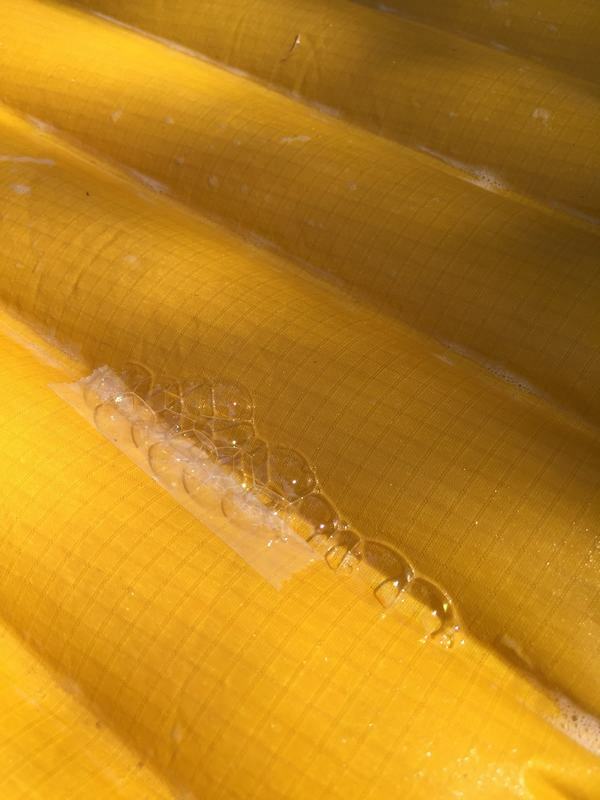 The air you are forcing through the rolled mattress, is pushing up through the hole, and making a bubble. If you do not see a bubble, go to the other end of the mattress, and start rolling. The puncture could have been concealed when you started rolling. No luck? Then turn over the mattress, wet it down as you did in Step 2, and repeat the process of Step 3. Still can't find that leak? 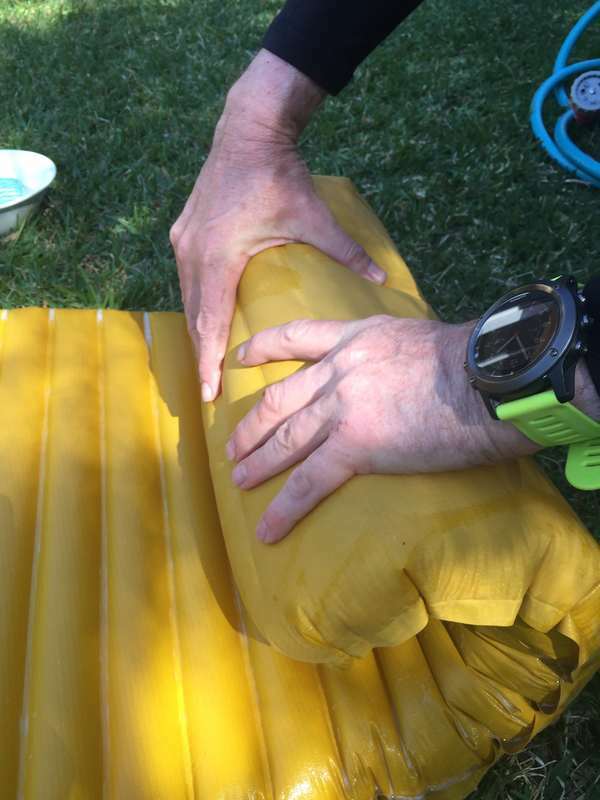 Then you can, if you have a bath handy, submerge the inflated mat in water (make sure the valve is done up before immersion) and look for little bubbles escaping. Mark the spot where the bubbles were coming from (and that's a bit tricky when the mat is wet) but you do need to find something that's going to help you remember where that hole was. Wash off all soapy water completely. ​Allow the mat to dry completely before attempting any patches. Now that the leak has been identified, and the mat is dry, it's time to fix that pesky puncture. You have a few options on how to repair. Read up on what the manufacturer of your sleeping mat recommends. Choose your method of repair. Many sleeping mat manufacturers make patch repair kits, so you can purchase one of those. They tend to be a liquid adhesive and a patch, or some will contain adhesive patches, that peel and stick. You don't need to get a patch the same brand as your mat. 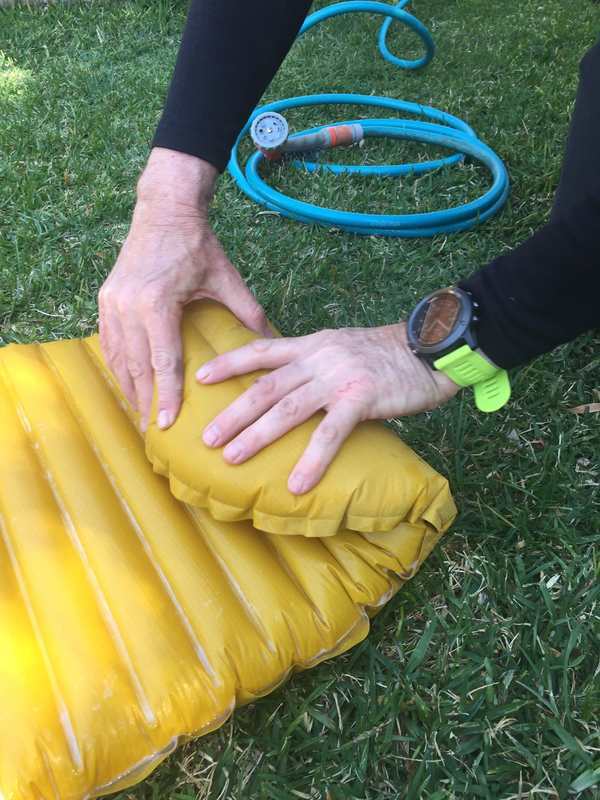 Therm-a-Rest have a specific kit if you wish to stick with that brand but you will have to hunt around for it in Australia. You could use Seam Grip to fix the hole by applying over the hole. Tenacious Tape could be used to cover the hole. This tape is handy just to have around the place. Some people will use a combination of these 3 methods to be really sure, and its going to depend on the size of the puncture as well. If available, you can clean the area with an alcohol wipe to ensure its very clean, and will help with adhesion of the repair. This is not a mandatory step but recommended. With your chosen method of repair, apply to the leak. If using Seam Grip, apply, not just over the hole but in surrounding area (like 2-5 cm around the hole). Allow to dry completely, ideally, overnight. Desperate need to fix that hole before night falls? Try mixing a few drops of water with the Seam Grip, and then apply to the hole. It will cure faster. 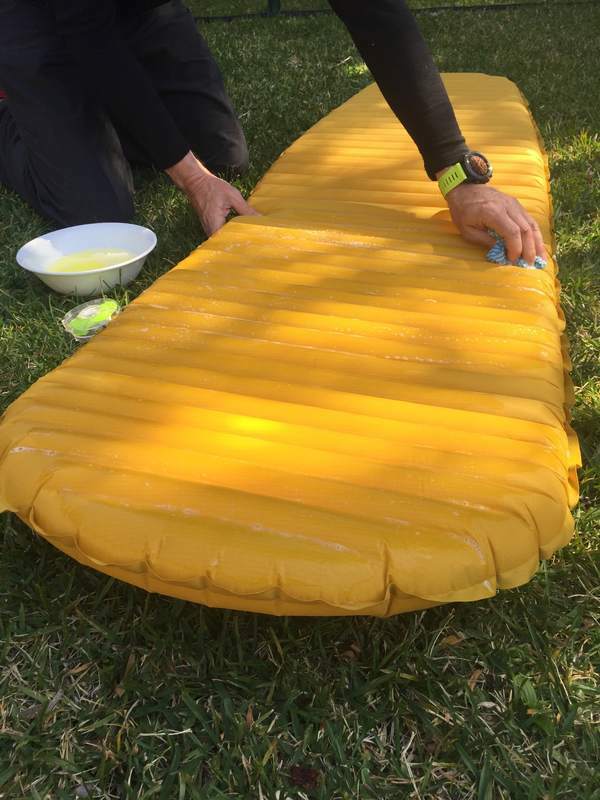 Using a self adhesive patch, make sure the patch is larger than the hole, and apply the patch over the hole, holding it down on the mattress to ensure it bonds well. If in any doubt about it, you can also apply some Seam Grip to help it stay longer. You could use 2 patches, overlapping if required. Allow to dry completely, ideally, overnight. If using a patch plus adhesive, you cut the patch, to be larger than the hole. Apply adhesive in the area over the hole, and surrounding area, then apply the patch, holding down firmly to ensure it adheres properly and the patch covers all adhesive. Allow to dry. You many need to apply another layer of adhesive over the existing patch, and once again let it dry. Using Tenacious Tape, means the mat is ready to go straight away, so you don't have a waiting time but it would be best if you applied Seam Grip first, then put the Tape over the Seam Grip. Remember to make sure your Tape covers all the Seam Grip. Always allow your repair to dry completely before the "big test", which is lying on the mat and seeing if it deflates. If it does, then you might need to consider that it is the valve. Seam Grip could help you, though you may find you will need to see if the manufacturer provides a valve repair kit.